I am so excited to be a part of a super fun blog hop today!! Deck the Halls with Inky Paws!! We have a fantastic line-up so make sure you hop through and see all the inspiration. The hardest part of designing for this hop was narrowing down my choices! This year’s holiday stamps and dies from Newton’s Nook Designs have been just over the top great. But I kind of had to go “classic” so I pulled out Santa Paws Newton. I love this set! I stamped in Versafine Onyx Black and then colored Newton and his friends with my Winsor and Newton watercolor paints. Once everything was dry, I added some Clear Wink of Stella to Santa Newton’s list for some extra shine. Which brought me to choosing a sentiment. How could I resist this one from Sentiments of the Season?? I added a layer of gold washi tape and some gold sequins to add even more shimmer. Oh what fun! Deck the Halls with Inky Paws Special! 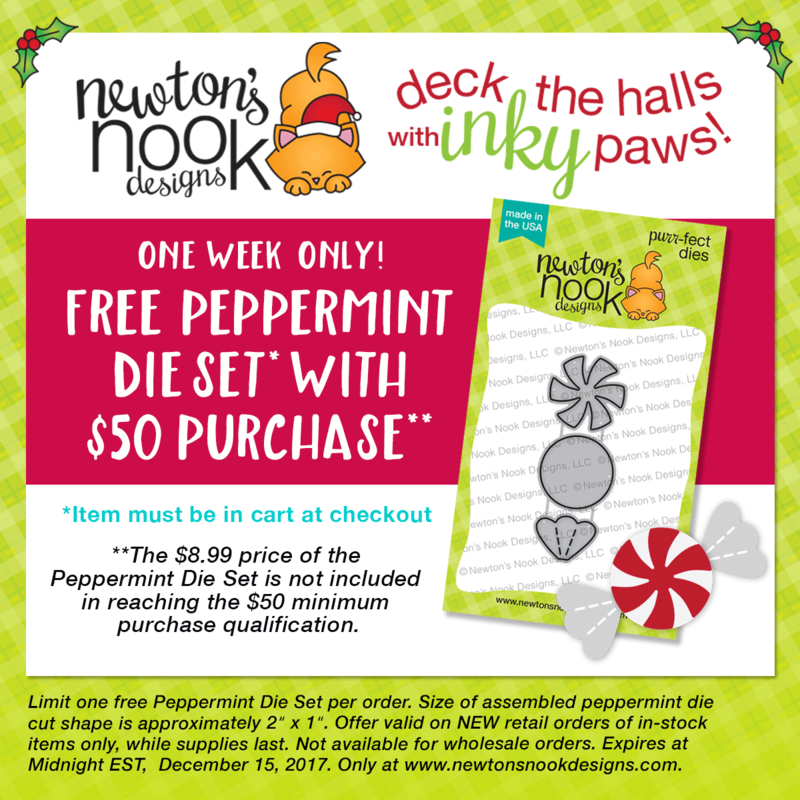 Newton’s Nook Designs is also releasing a NEW Exclusive Peppermint Die Set today! This fun new die set will only be available at Newton’s Nook Designs shop and you can get it for FREE this week with a $50 purchase! Offer is valid until Friday, December 15th, or while supplies last. This new die set is also available for purchase for $8.99. Enter to Win! Deck the Halls with Inky Paws Hop Prizes! We will be choosing two lucky winners to win a $20 store credit for Newton’s Nook Designs online shop! To enter, just leave comments on the Design Team Member and Special Guest blogs (see list below)! Two winners will be chosen at random from the collective blogs in the blog hop. Make sure to check out each of their blogs and comment for your chance to win. You will not know which blog has been chosen so the more you comment on the better your chances are of winning! You have until Sunday, December 10th at 9 pm EST to comment — winners will be announced on the NND blog on Monday, December 11th. I am so glad you have joined in today and I hope you enjoy hopping as much as we enjoyed creating for you! Thanks for stopping in and see you again soon. Simply beautiful and so elegant!!! Thanks for sharing this amazing card!!! Your card is so simple and sweet! I love the way you colored the image and the fun tiny touch of gold on the diagonal! Thank you so much for being part of our Deck the Halls with Inky Paws blog hop!! This is really darling! The little mice are really cute! Awesome coloring on your adorable Newton card! He is so cute with his little mice helpers! So darling. I love the layout, the background, the colors, the mouse…the entire card crafted package! Way to go! what an adorable card! I love the green background with the white splatters! It really makes Newton shine! Too sweet. Love that green background and of course Newton could not be sweeter. Nicely done. This is such a wonderful card. That great little Santa Newton takes center stage. Brilliant. Cheers. What a sweet card, love Santa Paws! Cute. I like the diagonal design. Perrrfect Christmas colors on this stamp that is onebof my new favorittes. I’m in love ! Charming card featuring the Santa Paws Newton stamp set. You did an awesome job creating it! Awwww… don’t you just love Santa Newton??? So sweet! This design is really killing me, Jen! The adorable image on such an elegant background, perfection! Your card is beautiful ! The choice of colors is perfect. Newton is just darling and I love the sparkling background! sparkles are always good! cute! I love those darling little mice, eek, so cute!! Ooo, I love the shade of green that you went with for the background. The deeper greens just scream Christmas to me, and it highlights your beautiful watercoloring so nicely. Thanks for sharing your wonderful ideas with us! Refreshing green background on your lovely card! Such a fabulous card! Love the colours you used – great design! Beautiful colouring on your card. Thanks for sharing the inspiration. Beautiful card~.The cat looks like he’s floating. Just awesome! I like the way you left the white at the bottom. The sentiment really stands out. Definitely liking the card layout and adorable cat.